Acrobatic Gymnastics is one of the oldest known sports originally practiced by the ancient Egyptians. Today, Acrobatic Gymnastics is a demanding artistic discipline for both boys and girls, requiring an extraordinary amount of strength and skill amongst gymnasts. It also involves the sport of tumbling. Acrobatic Gymnastics requires strength, agility, flexibility, balance and acrobatic skills. The results are spectacular with intricate balances performed on partners, exciting multiple somersaults and twisting somersaults with partners being pitched and caught. The top gymnasts need to be aerial, of small body feature, highly flexible and nimble, while the base gymnasts need to be strong, of larger body frame, steady and powerful. The routines presented in competitions are up to 2 minutes and 30 seconds in length and must include a number of required collective (partnership) and individual elements of three different types: static (balance), dynamic, and combined. Static routines must present balanced pyramidal constructions held for 3 seconds and other elements of strength, flexibility and agility. Dynamic routines must present flight elements such as throws, pitches and catches as well as dynamic tumbling elements. Combined routines present elements from both the dynamic and the static routines. The OGC offers a developmental acrobatic gymnastics program for athletes as young as 7 years of age where athletes will learn the basic skills of partner gymnastics and continue to develop their individual gymnastics elements. This level will also introduce gymnasts to learning choreography, routines and experiencing interclub competitions. 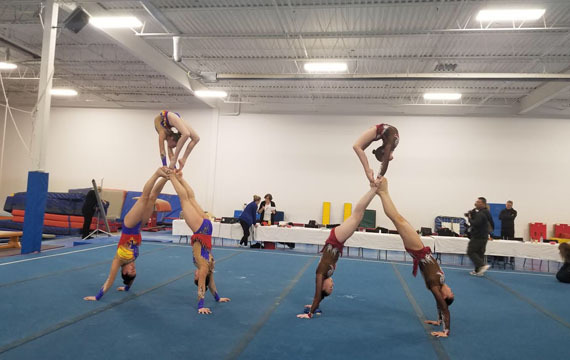 For athletes looking to get a head start before trying out for the Developmental Acrobatic Gymnastics group there are several recreational acrobatic gymnastics classes offered throughout the week. This level of acrobatic gymnastics will build on the skills athletes learn in the Developmental program. Drill work, skill basics as preparations for higher level skills and more individual tumbling elements will be the focus. Routines play a larger role in the Provincial stream with continued work on learning more complex choreography, dance basics, and routine presentation. Athletes in this level will compete at Provincial competitions and Provincial Championships. The Elite level is for athletes who have a background in gymnastics and acro. They should have already developed their individual skills and be ready to add flipping and twisting to the dynamic throws and catches involved in acrobatics. As well handstand work, strength and flexibility will be the focus of the physical preparation component of the Elite program. Routine development, multiple routines, choreography, artistry and peak performance will all be emphasized in this level. Athletes in the Elite program will compete at Provincial competitions, Provincial Championships and have the opportunity to participate in meets across Canada and possibly internationally.